The United People’s Freedom Alliance (UPFA) had its parliamentary group meeting on Monday to discuss their role in the House as the Opposition. The UPFA, which commanded a majority of two-thirds, was relegated to the Opposition after new President Maithripala Sirisena appointed then opposition leader Ranil Wickremesinghe as the Prime Minister immediately after being sworn in . After that, the new Cabinet of Ministers was sworn in. But, it is a minority Government appointed for an interim period to execute the 100 day programme of President Sirisena. The UPFA has the majority of MPs though it has been demoted to the Opposition at the moment under the new governing arrangement. This created an arduous task for the parliamentary authorities to make seating arrangements in the chamber of Parliament. Benches in the Opposition side are insufficient for the accommodation of all the UPFA members. "Mahajana Eksath Peramuna (MEP) leader Dinesh Gunawardane quipped about the criterion for the allocation of seats among members in consideration of their seniority and positions. And, Chief Opposition Whip John Seneviratne responded saying that 35 members of Sri Lanka Freedom Party (SLFP), the largest ally of the UPFA, would sit in the government side instead. " Mahajana Eksath Peramuna (MEP) leader Dinesh Gunawardane quipped about the criterion for the allocation of seats among members in consideration of their seniority and positions. And, Chief Opposition Whip John Seneviratne responded saying that 35 members of Sri Lanka Freedom Party (SLFP), the largest ally of the UPFA, would sit in the government side instead. The participants of the meeting burst into laughter upon hearing this remark, as it appeared to them a novel kind of political set-up. The political party headed by the Executive President plays the role of the main Opposition in Parliament, and 35 of its members occupy Government benches as part of new seating arrangements. “Nowhere has this sort of arrangement been made in Parliament. It is only in Sri Lanka,” a participant uttered. Be that as it may, with the change of Government, the UPFA technically ceased to be existing as a unique, separate political formation in Parliament any further. It so happened because all its alliance parties including the founder members such as MEP and Eelam People’s Democratic Party(EPDP) decided to act as independent parties in the Opposition in Parliament. "Soon after this 100-day programme of the interim government, a general election will be declared. The parties will contest in their own or in alliance with like-minded groups , and the one securing the highest number of seats will be called in by the incumbent President to form the next government. But, for the time being, the parties look united for a common cause - the implementation of the 100-day programme." The representatives of the seven alliance partners of the UPFA - MEP, EPDP, National Congress, Democratic Left Front, Lanka Samasamaja Party (LSSP), Communist Party and National Freedom Front- met with Speaker Chamal Rajapaksa and asked him to recognise theirs as parties independent of the UPFA hereafter. The Speaker willingly entertained this request, and instructed his officials and staff members to assign seats for the leaders of these parties in the front row of the opposition side. With such recognition, these parties are now entitled to the benefit of making special statements in the House as provided by the parliamentary Standing Orders. This symbolised the political disintegration of the UPFA formed in 2004 as a broad electoral front against the then ruling United National Party (UNP). Janatha Vimukthi Peramuna (JVP) was also a founding member of the UPFA. Also, it was the earliest party to quit the UPFA. 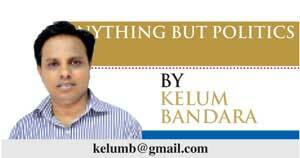 Today, SLFP is left to its own political identity. This division among UPFA alliance partners does not have any electoral validity, as at the moment, everyone is focused on the 100-day programme of the new Government. Soon after this 100-day programme of the interim government, a general election will be declared. The parties will contest on their own or in alliance with like-minded groups , and the one securing the highest number of seats will be called in by the incumbent President to form the next government. But, for the time being, the parties look united for a common cause - the implementation of the 100-day programme. The pruning of executive powers to be vested with the Legislature, the enactment of the National Audit Act and the Right to Information Act are among the salient targets to be realised during the interim period. Besides, the new Government headed by Prime Minister Ranil Wickremesinghe in Parliament and the President are slated to announce price reductions of fuel and other essential commodities in its interim budget to be placed before Parliament on January 29. After the period, a parliamentary election will follow. For that purpose, it is learnt that Parliament will be dissolved on April 24 so that the election could be conducted in June. It means a new Parliament empowered with more legislative powers will govern the country starting from the second half of this year if the 100- day targets are well realised. The political parties, be they in the Government or the Opposition, are planning for this election right now. President Sirisena also asked the leaders of the political parties to get ready for such a snap election after the period of his interim government. He announced it to them at a meeting on Monday. The UNP, as the main party that backed the President during the election, is hopeful of securing victory at the next election to form a government of its own. Likewise, SLFP, now headed by President Sirisena as its Chairman, looks forward to this election. There are parties evolving strategies to rally around SLFP in the hope of capturing parliamentary power for a new political journey under the President. On the other hand, a few MPs who initially crossed over from the UNP to SLFP, are contemplating to make a comeback to their original political bases in view of the next parliamentary election. Hence, the next election period is likely to be live with much activism. But, what is crucial at the next election is the kind of role to be played by President Sirisena. If he remains neutral as the Head of State, a competitive political battle can be anticipated between the two main parties. Yet, in case the President sides with one political formation, the tide will turn accordingly. It is due to the simple reason that Sri Lankan voters are not used to have a President from one party and to give parliamentary power to another. In this respect, fear has struck some members of the UNP who are inclined to believe that the President will stand with the SLFP. It is reasonable for them to have such fear and anxiety as the President took over the chairmanship of SLFP from his predecessor. At the same time, there is another school of thought that he, as someone elected to the presidency after contesting as a common candidate with the backing of opposition parties in particular, will stand up for a moderate line without campaigning for any selected party or alliance . It is too early for any concrete conclusion to be made in this regard. Yet, politically savvy people keep their fingers crossed. However, it will be a tremendous gain for the whole country if the 100-day programme were executed, and the desired objectives reached. For that, the new Government has to be prevailed upon so that it cannot abdicate its responsibility. Prime Minister Ranil Wickremesinghe, in his address to the House on Tuesday, outlined the 100-day programme to be executed, as he said, with the support of all the parties. Right at the beginning of his speech, he took a swipe at National Freedom Front leader Wimal Weerawansa . He accused Mr. Weerawansa of arousing communalism with his statements and remarks. “In fact, you brought about the downfall of former President Mahinda Rajapaksa. Now, you are arousing communalism to confuse the political situation. I am asking you not to do it,” he warned. 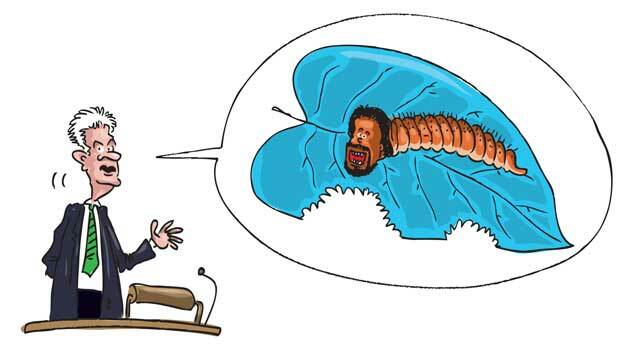 Mr. Weerawansa, in his turn, retorted to the remarks of Mr. Wickremesinghe . “If I brought about the downfall of the former President, I should have become your best friend today. I have no intention whatsoever to have a friendly relationship with you. MEP leader Dinesh Gunawardane was the first party leader to eulogise the contribution of former President Mahinda Rajapaksa to wipe out terrorism. He devoted a large portion of his speech to praise the former President, and asked the Government not to disregard it. After he finished his speech, MP Namal Rajapaksa, the son of the former President, rushed to Mr. Gunawardane , and thanked him for his praises. Foreign Affairs Minister Mangala Samaraweera flew to India on January 18 for a two-day official visit. He met with his counterpart Sushma Swaraj. Also, he paid a courtesy call on Indian Prime Minister Narendra Modi. Mr. Samaraweera, in his remarks in India, noted that it looked like a friendly visit at the start because his Indian counterpart was his personal friend. “We held telecommunication portfolios on either side of the Palk Straits,” he said. During his meeting with Mr. Modi, he extended the invitation of President Sirisena for a state visit to Sri Lanka. Accordingly, Mr. Modi will arrive in the country in March, the first state visit by an Indian leader after 1987. Before that, President Sirisena will go to India on a state visit in February. Besides, Ms. Swaraj is also expected to undertake a visit to Sri Lanka next month.